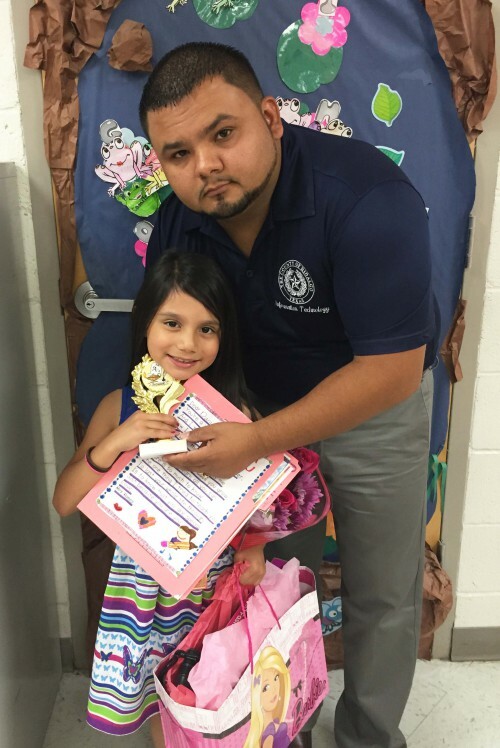 Daniel Silguero with his daughter, Danielle. Mr. Silguero found encouragement to face leukemia through his regular reading of a New Testament received from a Gideon. While earning his degree at South Texas College, Daniel Silguero received a New Testament from a Gideon participating in a Scripture distribution. Already a believer, he thanked the Gideon, slipped the New Testament into his backpack, and promptly forgot about it. He began to consider what the road ahead would look like and how the cancer would affect the remainder of his life, as well as the lives of his wife, Maricela, and his two young children, Danielle and Andrew. Just as he was beginning to lose hope, Daniel came across the New Testament that had been handed to him years earlier. Daniel’s experience convinced him that he needed to be more intentional about witnessing to others, so they could experience the same peace he is experiencing. He decided one way to do that was to sign up to become a Friend of Gideons. As a Friend, Daniel has opportunities to participate closely with Gideons in reaching the lost with God’s Word. He also receives regular updates about the impact Gideons are making throughout the world. If you would like to find out how you can serve, as either a prayer or a financial partner, along with more than 90,000 other Friends of Gideons throughout the world, please click here. A serviceman in a Special Forces unit in Ecuador reads his Service Testament moments after receiving it from Gideons during the 2015 Ecuador International Scripture Blitz. “This is the greatest weapon you will own… use it, read it, and I promise you will be more effective soldiers,” the unit’s commanding officer told his troops. The Gideons International officially began distributing Scriptures to soldiers in 1941 at induction centers under the motto, “arm them with the Gospel too.” While Gideons are mostly known for placing God’s Word in hotels, reaching the lost with the Gospel includes distribution of Scriptures at the military installations of a multitude of countries, including The USA, The British Isles, The Republic of China, Korea, Latin America, West Africa, and Japan. Last year, Gideons placed and distributed over 1.7 million Service Testaments. 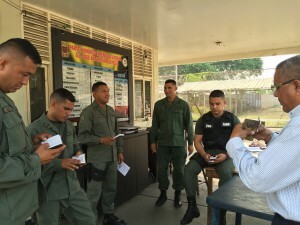 Members of the Venezuelan National Guard in Puerto la Cruz explore the Scriptures they received from Gideons during the 2016 Venezuela International Scripture Blitz. 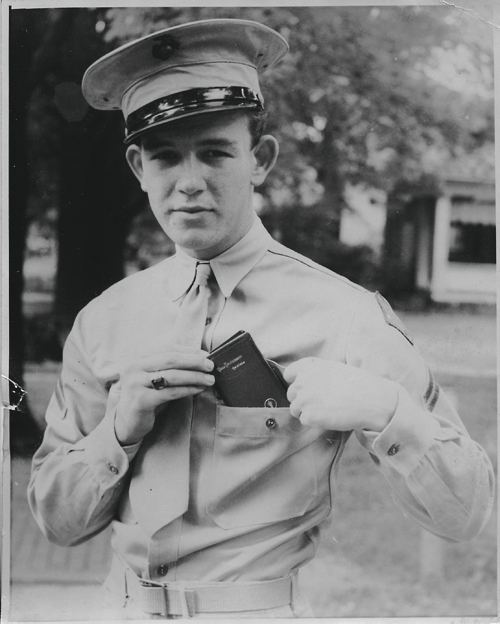 Gideons have been distributing Scriptures to men and women in the armed forces since 1941. Through trusting the Lord and regular time spent in God’s Word, a soldier is armed for spiritual battles. In 1940, Charles J. Pietsch, a member of The Gideons International, felt led to contact the Chief Chaplains of both the U.S. Army and Navy. He was seeking permission to give a copy of the New Testament to every man and woman in the armed forces of the U.S. who wished to receive one. Navy Chief Chaplain R.D. Workman met with Mr. Pietsch in Washington D.C. and immediately granted approval to the proposal to offer Testaments to naval personnel. So in January of 1941, the decision to supply armed forces with copies of God’s Word was approved by The Gideons International and 50,000 Testaments were ordered. On December 2, 1941, some of the first Service Testaments from The Gideons were distributed to the U.S. Navy personnel at Pearl Harbor. Five days later, Pearl Harbor became ground zero for a date that would live in infamy. Years later, in 1949, U.S. General Douglas MacArthur sent a telegram to The Gideons International asking that a representative of The Gideons International be sent to Japan to “Make first hand survey of situation [sic]” in regards to distributing New Testaments to the people there stating that, “Your assistance will be of inestimable value.” The Gideons responded to the request and in 1950 the first Gideon camp in Japan was established. Veteran Carl Crisp received his New Testament from The Gideons at an induction center in Houston, TX. Crisp served in the US Army as a UH-1 helicopter crew chief during the Vietnam war. “I carried my New Testament with me at every duty station during my time in Vietnam. 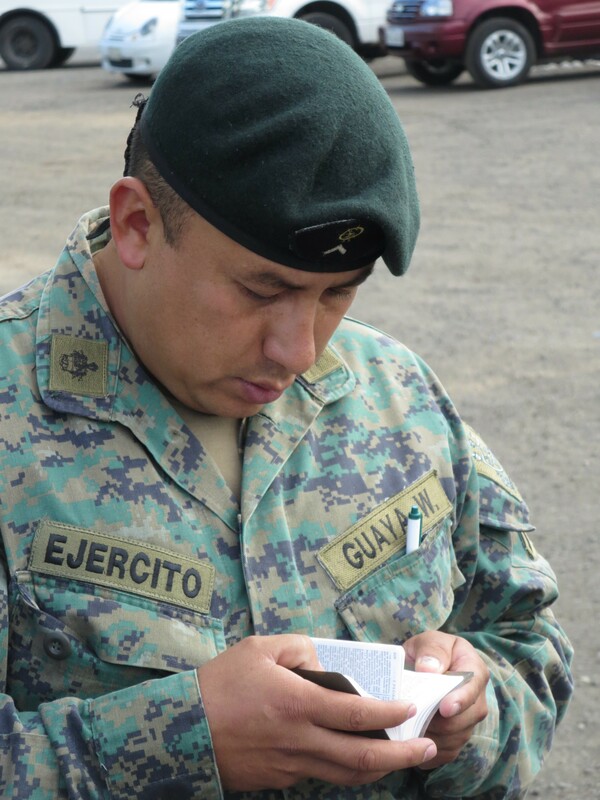 It was a comfort to me–a constant reminder of God’s love and of my salvation should I not return home.” Crisp says he remembers his comrades also held onto their New Testaments and often saw his fellow servicemen reading the Scriptures. Today, Crisp serves the Lord as a Gideon in the Palestine Camp, Texas. 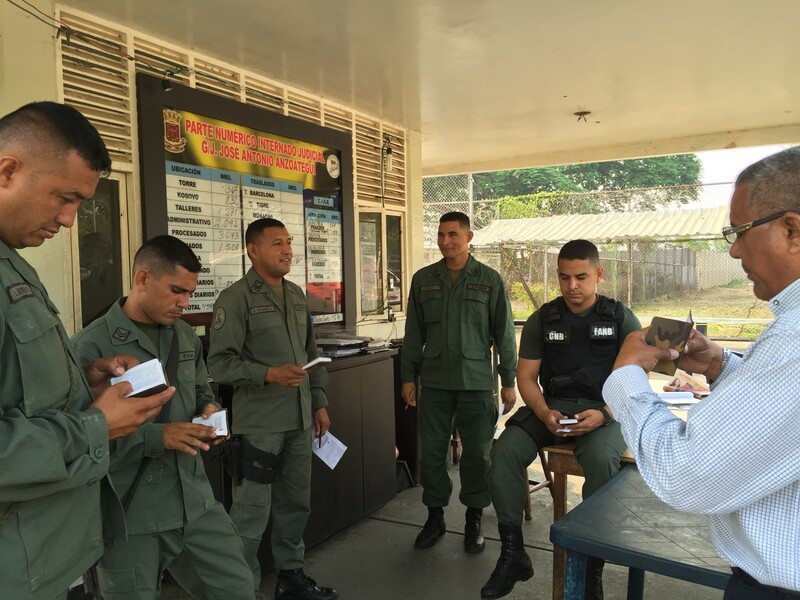 Last year, Gideons placed and distributed over 1.7 million Service Testaments to military in a number of countries, territories, and possessions – from Japan to Latin America. While disembarking from the U.S.S. Breckenridge after its return from the Korean War, serviceman Orv Room received a New Testament from The Gideons. “Over 50 years later, I still have it in my possession,” says Orv. He says its message transformed his life. In fact, Orv began serving in The Gideons in 1956 and his wife, Corine, joined the Auxiliary in 1957. They still serve in the Sacramento North Camp, California. After graduating from the University of Houston, Jim Blunk joined the military. He attended flight school and became an Army helicopter pilot. While serving overseas in Operation Desert Storm, he noticed a chaplain bringing boxes of New Testaments into the mess tent. Jim witnessed lives being transformed and baptisms taking place in the middle of the desert. Though his father was a pastor and had always taught him about the Lord while growing up, Jim admits he didn’t fully understand what it meant to be a Christian until he was an adult. In the mid 1990s, Jim was recruited for a different type of service by a retired colonel, who also served in The Gideons. Since 1997, Jim and his wife, Lannis, have served with the Granbury Camp of Gideons in Texas, helping to reach lost men, women, boys, and girls with God’s Word. When we introduce soldiers to Scripture, we’re introducing those who are ready to make the ultimate sacrifice for their nation to the One who sacrificed his life for the sins of the whole world. We thank God for bringing so many from the trenches to His side through the reading of His Word. Please continue to pray for the safety of the men and women in uniform around the world, and for the chaplains who serve them.